Use code “JOELT20” for a 20% discount! 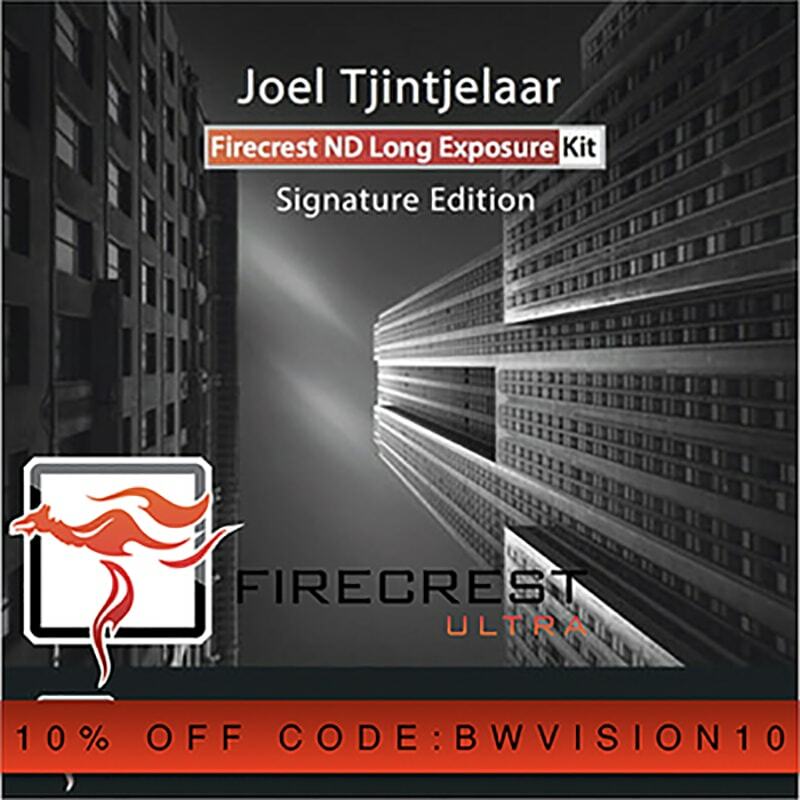 The REVISED Formatt-Hitech “Firecrest Long Exposure Joel Tjintjelaar Signature Edition” kit#1 and kit#2, featuring the brand new Firecrest ND filters and New Filter Holder light leakage proof set with integrated polarizer filter. These filters are extremely neutral and ultra thin. With the new 13- and 16-stops ND filters, stacking filters is no longer needed – effectively eleminating vignetting problems. There are two kits, each containing three filters. Kit#1 comes with a ND 0.9 (3 stops), ND 2.4 (6 stops) and a ND 3.0 (10 stops). And kit#2 comes with a ND 3.0 (10 stops), ND 3.9 (13 stops) and a ND 4.8 (16 stops). Both kits are available in either circular or rectangular format. The rectangular kit comes also with the new filter-holder (light-leakage proof with end-caps) and integrated polarizer filter. For more info on the signature edition kits, click here. Advanced Firecrest multicoating technology results in hyper neutral ND filters, the most neutral ND filters available on the market today. Available as square and rectangular filters. Use code “BWVISION10” for a 10% discount on all Formatt Hitech items. Companies such as B&W* and Hitech Formatt have developed ND filters that surpass the Big Stopper and by some considerable margin. In particular, Hitech Formatt brought out the IRND range and more recently, the new Firecrest 16 stop filter – which has literally been a game changer for me. No horrible colour casts and accurate exposures are now the order of the day and with 16 stops to play with, the Firecrest IRND opens up many possibilities for long exposures in bright daylight. The Singh Ray 15 did not correct well and would require more advanced methods using RGB curves to remove the red cast, a time consuming task. The Lee’s cleaned up quite well, which is due to the blue cast being easy to fix by just warming up the white balance. The Firecrest was also easily corrected using only white balance, quite impressive for a 16 stop filter! For reference the Lee Big Stopper required a large white balance correction, going from a Temp of 5000 to 9300 and a Tint of +5 to +19, the Firecrest on the other hand only needed to go to a Temp of 5400 and a Tint of +1, a very small adjustment.” and “When shooting with a Lee Big Stopper you need to adjust the white balance in camera to 9300 to ensure you do not need to make a large adjustment later on, when using the Firecrest there is no need to set your white balance like this, daylight is very close.” and finally “I was extremely surprised by Singh Ray, a company that typically makes the best filters on the market proved to be a disappointment here. This is good news for the consumer though as Singh Ray is also extremely expensive. The good news is the Firecrest is actually quite affordable and performed exceptionally! I would highly recommend this filter. We have obtained a white balance of 6650, +20. Therefore, it is not really neutral but its deviation from the white balance of 1050, which means it’s going to get photos from a slightly cold dominant. What we do see is that there is a deviation towards green color which has required a correction of +38 from the photo 1. But it is much more neutral than the Bigstopper filter, and considering that is 6 stops more “dense” this filter is much more dense than the Bigstopper. When I saw that the Firecrest 16 could give me an exposure time of 6 minutes at ISO 200 and an aperture of f11, I knew we would get along real fine despite our earlier gasket issue. The resultant images were even more neutral than my old Pro Stop IRND. It was a great rush to be able to shoot in broad daylight for minutes at a time again. Most photographers fear scratching the coating, with the Firecrest they can rest assured as the coating is sandwiched between the glass.” and “As you can see there is no colour cast, and both look as neutral as I could hope for. I used to use Hoya, B+W and Tiffen ND filters which all had significant colour casting from magenta to blue. If you are someone that likes to have the opportunity to shoot long exposures during the day, and are looking for a single solution then why not take a look at Formatt-Hitech’s Firecrest 16, it could revolutionise your photographic experience. And it looks pretty damn good. Actually, what I should say is I haven’t seen this level of controlled performance from an ND filter set before. This is pretty amazing if you consider the density range” and “There’s no dominant color cast that I can see, which is fantastic. I’ll go out on a well supported limb here and say that these are the most neutral and consistent ND filters currently available. I have to say that out of all the ND filters I have owned for Long Exposure photography, the Hitech 16 Stop Firecrest in my opinion out shines all the other makes. It’s neutrality is amazing for a filter with such high filtration.” and “Too early to say just yet but going from the only shot taken, the exposure was right on the money unlike the Lee Big stopper which had a tendency to underexpose around 1 full stop.